You are here: Home / The Scoop: Godzillaaa!! Hey there, duelists! Welcome back to The Scoop! The absolute realest Yu-Gi-Oh! News Report on the internet, and of course it's right here on ARG! This weekend is the sneak preview for the upcoming TCG set release, Clash of Rebellions! It brings support for archetypes like Red-Eyes, Toons, Cyber Dragons, and Infernoids! The set also introduces new archetypes Kozmo, based on a mixture of The Wizard of Oz and Star Wars and the Kaiju archetype, based on the monsters from the "Godzilla" series! It's definitely an exciting and innovative set, packed with some cards that are great for those who love the game and its competitive nature, as well as those who enjoy the themes and backstories of the different archetypes. This set has something for everyone to enjoy! Without further ado, I'd like to take today to discuss the Kaiju archetype, and its relation to the Godzilla series! 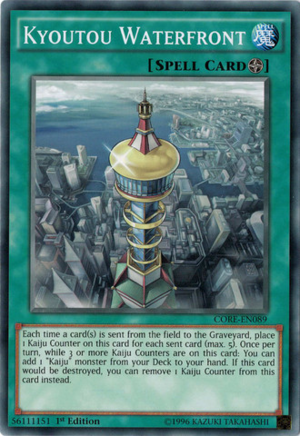 Each time a card(s) is sent from the field to the Graveyard, place 1 Kaiju Counter on this card for each sent card (max. 5). Once per turn, while 3 or more Kaiju Counters are on this card: You can add 1 "Kaiju" monster from your Deck to your hand. If this card would be destroyed, you can remove 1 Kaiju Counter from this card instead. This card is a really cool introduction to the archetype because it's the set up for the effects of the current(and most likely future) Kaiju monsters! It holds the all-necessary Kaiju counters which are the catalysts for the effects of the Kaiju and acts as the archetypes searcher all while avoiding destruction time after time! What else would you expect, when they're expecting large monsters to be stomping around on a daily basis?! Based on the Japanese capital, Tokyo, this card definitely serves as the "capital" of any deck that seeks to abuse the effects of the powerful Kaiju monsters! You can Special Summon this card (from your hand) to your opponent's side of the field in Attack Position, by Tributing 1 monster they control. If your opponent controls a "Kaiju" monster, you can Special Summon this card (from your hand) in Attack Position. You can only control 1 "Kaiju" monster. Once per turn: You can remove 3 Kaiju Counters from anywhere on the field; destroy all monsters your opponent controls. This card cannot attack the turn you activate this effect. 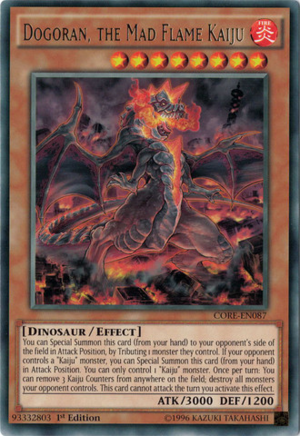 The Kaiju monsters have summoning conditions similar to cards like Lava Golem and Volcanic Queen, in that they can be Special Summoned to your opponents side of the field by offering their monster as tribute. Once your opponent controls a Kaiju monster, you are free to special summon them from your hand to your side of the field and make use of their effects, especially while on their home turf: the city of Kyoutou! Dogoran, the Burning Godzilla replicate is the beefiest and comes as a walking 3000 ATK Raigeki if you have enough Kaiju counters on the field! As a small note, it IS the Burning Godzilla, even though its name closely resembles that of a squid-like Godzilla monster by the name of Dogora. With a form like that, it's no wonder that it destroys all of the monsters your opponent controls! This card isn't out of control, though. It does nothing that other cards, which come at much easier costs, don't do. This isn't the definition of a powerful card. It's effect can absolutely change tempo, but so can cards like Raigeki and Dark Hole with much less set up. It just does it in a rather cool looking and feeling way! In the series, when Godzilla fights Destroyah, his internal radiation overcomes him and after reaching a temperature of 1200°C, he suffers a complete nuclear meltdown. Earlier, though, Destroyah killed a young Godzilla Junior and, unfortunately for Destroyah, doesn't completely dispose of it. After the meltdown by the adult Godzilla, the injured Junior absorbs its radiation and matures into an adult to pick up where Godzilla left off. During that temperature rise, we get the first glimpse of the Burning Godzilla! You can Special Summon this card (from your hand) to your opponent's side of the field in Attack Position, by Tributing 1 monster they control. If your opponent controls a "Kaiju" monster, you can Special Summon this card (from your hand) in Attack Position. You can only control 1 "Kaiju" monster. When your opponent Normal or Special Summons a monster(s): You can remove 2 Kaiju Counters from anywhere on the field; until the end of the next turn, that monster(s) cannot attack and its effects are negated. Kumongous is based on the giant spider Kaiju in the Godzilla series, Kumonga! 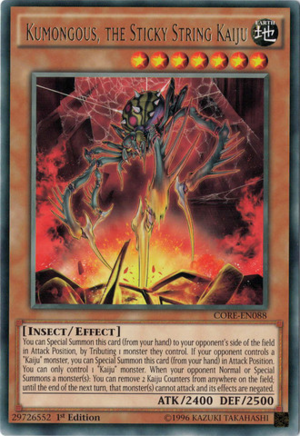 Its effect fits its persona of being able to spend sticky webs by not allowing your opponents monster to attack and negating its effects for a total of two turns! It's a bit smaller than its Burning Godzilla counterpart, but its effect is of a different breed and much more effective in the current game. Instead of a walking Raigeki, this is a walking Fiendish Chain that can activate as many times as you can get it to go off in a single turn! That can mean stopping a Deneb or an Altair or a Trishula when activated correctly! It's definitely not the greatest card, but the fact is that the archetype stories in Yugioh can get really interesting and expansive SOMETIMES! So I'm hoping I'm correct when I say that this archetype will continue to grow and add more boss monsters and become a force to be reckoned with! In Godzilla: Final Wars, Godzilla becomes ensnared by the strings of Kumonga, but proves to be too intelligent for the spider as he grabs a piece of webbing that is still attached to it and swings it around before releasing it, sending the spider flying farther than a Team Rocket blastoff. I, for one, appreciate when familiarity gets put into the game in the form of archetypes, and I'm always excited to see the progression of such archetypes. I was excited about Burning Abyss because they followed one of my favorite reads of all time. I'm excited about the Kaiju archetype because as a kid, I always enjoyed watching old Godzilla movies! Hopefully this archetype will gain enough steam in the coming sets to be competitive, but if not, it's still an awesome addition to the pool of allusions that are present in the game of Yugioh! but you didnt actually talk about the deck.